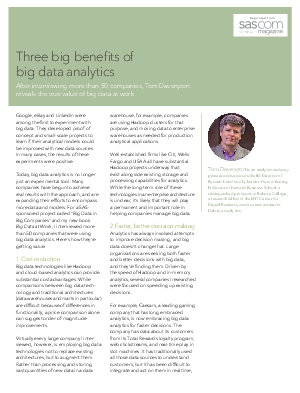 Today, big data analytics is no longer just an experimental tool. Many companies have begun to achieve real results with the approach, and are expanding their efforts to encompass more data and models. For a SASsponsored project called “Big Data in Big Companies” and my new book Big Data at Work, I interviewed more than 50 companies that were using big data analytics. Here’s how they’re getting value.